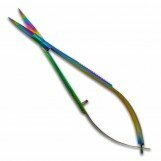 Titanium Rainbow Coating, Lightweight, Ergonomic spring action snips. Thin Curved Blade – allows you to get as close as you want without snagging, jabbing or poking your work. Micro Serrated Blade – holds your thread ensuring no slipping or bending, giving you a clean cut. Famore Stitch Snips can be Re-Sharpened – since we use a high quality German stainless steel. Bonus Attributes: beautiful colors, ergonomic hand crafted design, superior metals, razor sharp blades, ambidextrous: left & right handed use..